The chain conveyor uses light weight high density aluminium profile designed for pallet transportation. The profile is suitable for carrying heavy loads with minimum maintenance. 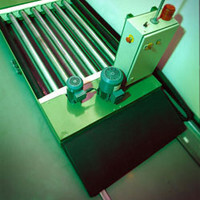 The conveyor is ideally suited for distribution centers and factories. The conveyor is rust free and environmentally friendly. Less Maintenance By using twin direct drives, driving chains are eliminated and the conveyor is reliable and safe. No grease or oil required as the chain guide is extruded high molecular plastic Low noise Low noise due to plastic chain guide and heavy extrusion Less Maintenance By using twin direct drives, driving chains are eliminated and the conveyor is reliable and safe. The build design and structure of the framework is 4mm thick mild steel angle to form a box section 70mm wide x 130mm deep. The design also includes the sideguide which is integral to the sideframe. The rollers obtain their Drive from ½” pitch chains, looped to the sprockets affixed to the rollers. The driveside of the side frame houses the sprockets and chains providing adequate safety guarding. Each module is able to connect and continue the drive to the next module via the connecting link which is included (at joint position and all required fixing points). 63.5mm Ø X 3.2mm BZP Rollers. 21 tooth, ½” pitch sprockets. Sealed for life precision bearings. 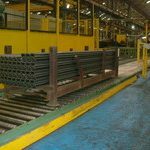 Widths to accommodate standard pallets = 800mm, 1000mm & 1200mm pallets. Standard module length = 1429mm. For individually driven zones a 0.25Kw drive is specified. For modules driving up to 3 zones from one drive a 0.55Kw is specified. Powder Coated Frame : Yellow RAL 1021. The build design and structure of the framework is 4mm thick mild steel angle to form a box section 62mm wide x 181mm deep. The design also includes the sideguide which is integral to the sideframe. The rollers obtain their Drive from 5/8” pitch chains, looped to sprockets affixed to each roller. The drive side of the frame houses the sprockets and chains providing the necessary safety guarding. Each module is able to connect and continue the drive to the next module via the connecting link, which is included (at joint position and all required fixing points). 89mm Ø X 2.9mm BZP Rollers. For pallet loading up to 1200kg a roller pitch of 198.4mm is specified. For pallet loading up to 1500kg a roller pitch of 135mm is specified. Each roller houses a 15 tooth, 5/8” pitch sprocket. 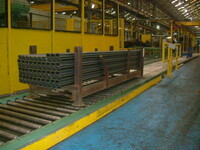 Widths to accommodate standard pallets widths of 800mm, 1000mm and 1200mm. For pallet modules driving up to 3 pallet zones on one drive, a 0.55Kw drive is specified (dependant upon pallet weight). Based upon application and design. Based on application and design.